You'll be £12.99 closer to your next £10.00 credit when you purchase A Barnsley Lad. What's this? Don Booker has been a journalist in Barnsley for over fifty years, during which he has regularly been at the centre of events. 'Barnsley Lad' is a colourful record of his life from growing up in Dodworth, to his retirement from the post of Editor of the Barnsley Chronicle in 1994.Typically, Don became involved in the successful drive to save Barnsley F.C., during the dark days that following the pit strike in 1984, an interest he has maintained to the present. He gives an entertaining account of how latest scores were relayed to him all over the world, when he was travelling widely as the motoring correspondent for the Chronicle. His interest in motorised transport began with an old, even when he bought it, BSA motorcycle, on which he took himself and Mike Parkinson, also a junior reporter at the time, to numerous events and incidents around Barnsley. 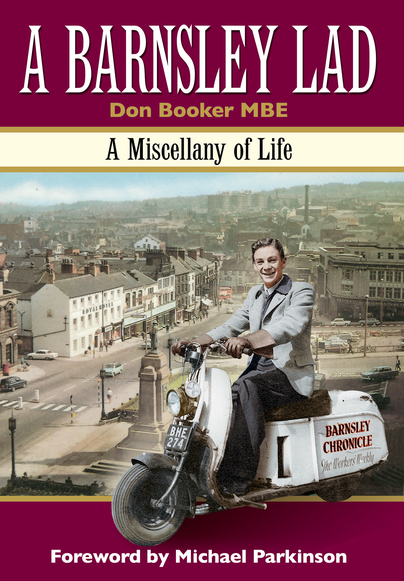 There are several accounts of his many adventures as motoring correspondent for the Chronicle, where he still presents regular reviews of new vehicles.The core of Don's book is his accounts of the people and places around Barnsley, which have left a a lasting impression on him and will in many cases, jog the memories of his readers. We meet errant journalists, councillors and travelling folk, dedicated public servants, public nuisances and the mass of people from all stamps who have crossed Don's path. 'Barnsley Lad', is a delightful ramble through a colourful life and will bring back a host of memories to all, but especially those who share Don's affection for the town of his birth, Barnsley. Donald Booker was born in Barnsley and has lived and worked in the town all his life. In 1994, Donald was awarded an MBE for his services to journalism and the town of Barnsley. Now retired, Donald still lives in Barnsley and writes a regular column for the Barnsley Chronicle.